Granite and marble are among the most popular choices for a kitchen countertop as they can both provide a quite elegant look to any kitchen space and are already available in a wide range of designs. However, there are some significant differences between these 2 natural stones and you should consider each of them in order to choose between granite and marble for your kitchen countertop. The benefits provided by a marble countertop include the fact that this material is less expensive when compared to granite thus becoming a more affordable luxury. Also, marble is extremely hygienic and pleasant to the eye. However, marble countertops come with several drawbacks as well and you should consider the following aspects when wondering whether a marble countertop is what you are looking for or not. First, marble countertops are quite prone to being scratched easily and they are not as resistant and hard as granite countertops. This means that marble countertops are less durable when compared to granite countertops. Also, marble countertops do not react too well with a wide range of chemical cleaning agents that can easily damage its surface and texture. Marble countertops do not react too well with heat either and you will have to avoid placing heated frying pans right on this surface. Juices and water can easily stain marble countertops if spilled. Additionally, marble countertops require a higher maintenance when compared to granite countertops due to an increased sensitivity towards liquids and heat. 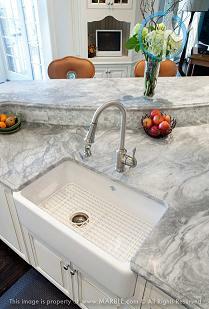 Marble countertops can easily be installed anywhere. However, they are not the best choice when it comes to high traffic areas. Usually, marble isn�t available locally and you cannot have it quarried since marble countertops come from abroad. On the other hand, granite countertops are available in a wide range of colors and finishing styles. For instance, they can come with a textured or polished surface. Granite countertops are immensely beautiful, durable and strong. Also, they are scratch and stain resistant thus becoming the perfect choice for families with children. Granite countertops are highly resistant to water and heat when compared to marble countertops. Additionally, they are quite easy to install and you can easily replace your granite countertop in case of a crack or chip. Despite its overall good features, a granite countertop comes with several drawbacks as well. Here are the most significant ones. Granite countertops are more expensive when compared to marble countertops as they are more durable than them. Also, they require extremely good care and maintenance in order to preserve their initial features. A granite countertop can crack quite easily too. Ultimately, the decision lies with you. Keep in mind that the main advantage provided by marble countertops is their affordability. On the other hand, granite countertops are to be regarded as hefty investments upfront but they pay for themselves over time due to all the benefits they provide.